While a separate source connected to the show downplayed that mandate somewhat—insisting, “We always strive to unveil new sketch material. We have as much fun doing political humor as we do skewering pop culture”—the push to incorporate more Trump has been evident of late in more frequent appearances from Fallon’s Trump impression, as well as recent additions like “This Week In Words,” a monologue segment that focuses on (Have you seen this? Have you heard about this?) things in the news. It sounds obvious, but it’s notable that summing up the week in political events is considered something of a departure for Fallon. And it’s a piece that gives him opportunity to take aim at Trump, something that has never been his forte. 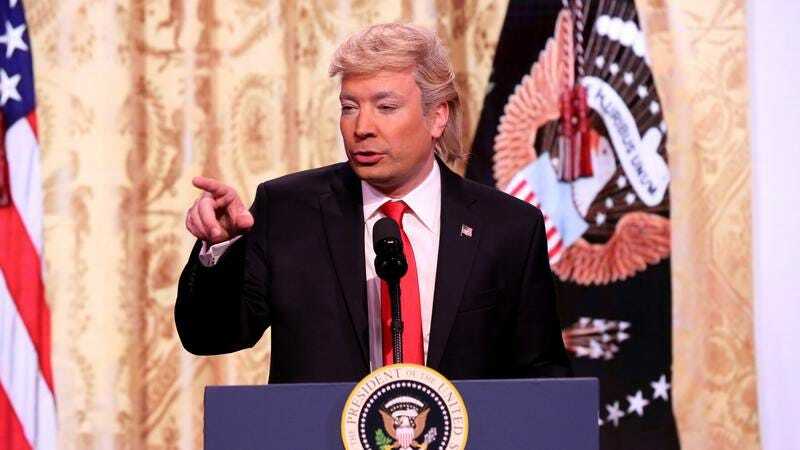 In fact, Fallon has been repeatedly criticized for his soft, playful palling around with Trump in the days leading up to the election—most recently by David Letterman, who reflected in a New York Magazine interview on how he would have relished the opportunity to “have gone to work on Trump,” calling him out on his lies and associations with white supremacists, and generally “give him a bit of a scolding.” Although Letterman explicitly said he “[doesn’t] want to criticize Jimmy Fallon,” the disappointment in Fallon’s performance is implicit. And the fact that Fallon has been repeatedly disparaged for his role in normalizing Trump—combined with his show continuing to function as a sort of fratty Cabaret inside a growing fascist state—probably isn’t helping his numbers among viewers who aren’t really interested in his usual schtick right now. Of course, it’s not just Fallon: Everyone is feeling the pressure to be “more political” because, quite understandably, it seems to be all anyone can think about. Even here at The A.V. Club, our political coverage (as it were) routinely outdraws everything else by thousands of pageviews; there’s the pervasive sense that right now audiences are only interested in things that directly engage with the world—whose incipient collapse they can’t take their eyes off for a minute—because everything else just feels irrelevant. Fallon would surely also love to get back to just goofing on movies and playing celebrity games full time. Reassuringly, one way or another, the current fevered pitch of political abominations eventually has to slow down or crater out, leaving a shellshocked nation once again gratefully turning to inconsequential silliness. But in the meantime, just like the rest of us, it seems Fallon has to adapt, at least until Mike Pence finally takes over and begins practicing a far more banal form of evil.